A while ago (I think it was Memorial Day week which was over almost a month ago I made these for breakfast/brunch. I usually use a recipe I have and try different variations on it. 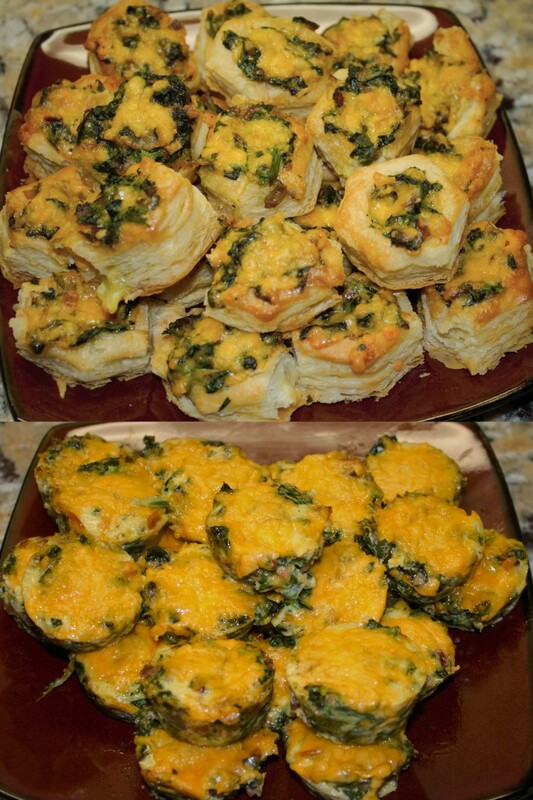 In this variation, I used the puff pastry cup instead of the sheets or making a crust myself. Also, I ended up running out of cup so I did some crustless ones as well. 1. Preheat oven to 400. Break pastry cup apart and place on baking sheet. Cook for 10-13 minutes. Take out oven. Sit aside to cool. 2. Microwave bacon slices for 2 minutes or until crispy. 3. Chop the mushroom with a smart chopper or by hand. Sit aside. 4. When bacon is done cooking chop and sit aside. 5. Microwave mushroom and spinach for 6 minutes. Drain water. 6. Mix together the bacon, spinach, mushrooms, with the 3 eggs, spices, and 1 cup cheese. 7. Stir will until all are mixed. 8. Place a spoon full in each cup. 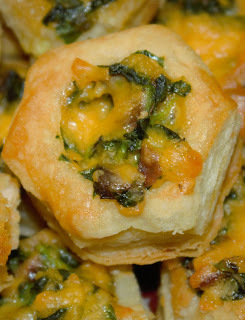 Use rest of mixture in greased mini muffin tin. 9. Sprinkle cheese on all the quiche before baking. 10. Bake the cup again for 8 more minutes until cheese is melted. Cook the crustless ones for 20 or until they look done. After asking everyone's opinion they all said that they like the crustless ones the best. Guessing because there was more filing since there was no crust. I will be back with another recipe next week. Have a great Wednesday and try not to melt in the heat.